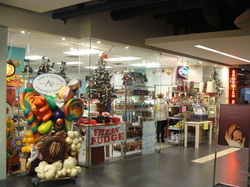 Amy's Classic Confections located in Minneapolis, MN was established in 2004. We are a full service candy store specializing in handmade confections, fudge, desserts and Italian Gelato. Our store is an unique experience for the sweets' enthusiasts. The cases are stocked full of everyday favorites as well as hard to find nostalgic treats. From Anise squares to RaZZles you'll find it here: German gummi bears, Jelly Belly jelly beans, Turkish Taffy and candy buttons. If you don't find it here - let us know and we will see what we can do. We use only the finest ingredients available in our handmade confections. Locally roasted and salted almonds and cashews, sweetened coconut flakes, fresh marshmallows and creamy caramel. All drizzled, dipped, drenched or coated to perfection. A taste sensation in every bite. If our confections are not made on site, we try to partner with other local chocolatiers to ensure a wide variety of other chocolate favorites. Come in and enjoy a treat for all your senses!